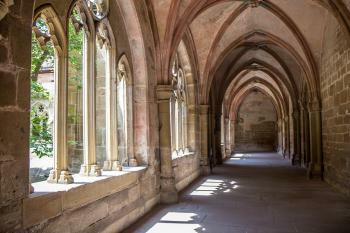 Maulbronn Monastery Complex is the most complete surviving Cistercian monastic structure in Europe. It includes an extensive water-management system of reservoirs and channels. The Cistercians laid out a network of approximately twenty natural and artificial lakes and ponds over several terraces. These were interconnected with an extensive system of trenches and canals. This former monastery was founded in 1147. It further developed from the 12th to the 17th century. The main church was built in a transitional style from Romanesque to Gothic. It was of fundamental importance for the dissemination of Gothic architecture over much of northern and central Europe. After the Reformation broke out, the Duke of Württemberg seized the monastery in 1504 and built his hunting lodge and stables there. Half a century later, the former abbey was given over to a Protestant seminary, which has occupied it ever since. The monastery complex included a number of craft workshops, which were occupied by lay brothers. Some of these outbuildings are made of stone, others are timber-framed. The whole complex is surrounded by a wall. The monastery is located on the outskirts of the modern town of Maulbronn. The Cistercians choose this spot for its favourable agricultural conditions - not because of reasons of seclusion. It really is a "complex", behind its walls lies a large square with several public buildings, a mill, a bakery and the monastery of course. I arrived already at 9.15 a.m. The people at the reception gave me a bewildered look, but sold me an entrance ticket for 6 EUR anyway. There were no other visitors yet. The only people around were about 20 regional craftsmen that were preparing their stalls for an Easter market. So I wandered around alone in the monastery too. It was a dark and cold morning, which gave some extra gloom to the already austere surroundings. There's not a lot of frivolity to see inside apart from some faded frescoes. Most impressive are the large halls were the monks and the lay brothers (separately) used to dine. What I liked most about this WHS were its intact surroundings. The timber-framed buildings on site look very authentic, you just wait for the medieval fair to start. They now have modern use (as restaurant, wedding chapel, museum, city hall). On the hill the terraces and vineyards developed by the monks can still be seen. When I reached the small town of Maulbronn around 11 AM, the sky was dark and cloudy with shower rain, and I heard the sound of roaring thunder nearby, a bad day for sightseeing and no surprising I was the only visitor to this World Heritage Site of Maulbronn Monastery. I really impressed with the complex when I first saw it, it was almost like a small walled separate village inside the town of Maulbronn with rows of beautiful half-timbered buildings that normally located in German historic town center. The monastery itself was the largest building with interesting mix of Romanesque and Gothic. After I bought the ticket from visitor center, I walked pass the square with fountain to the entrance of the monastery. The first thing I saw inside was the cloister with big beautiful blooming magnolia tree, such a beautiful sight, the magnolia enhanced the whole cloister to be very dreamy especially around the fountain house. The fainted pink wall paintings on the ceiling of fountain house resonated the blooming pink flowers. Maulbronn welcomed me with a striking view. Then I went inside the Romanesque church, it was very dark, I hardly saw the details of beautiful ceiling and choir. Maybe I misunderstood in something, I initially thought that the Cistercian monastery should be plain and austere, but at Maulbronn there were many wall and ceiling painting and colorful brick which really made the complex lively than I expected. Most of the other parts of the complex surrounded the cloister were just empty halls, and most of them were under renovation. After I saw all the thing that still opened, I heard the sound of thunder again, so I decided to go outside and took some photos, and when I reached my car, the heavy rain started. I quite enjoyed my trip at Maulbronn despite its small size and I spent only 1 hour in this place. The complex’s architecture and surrounding were beautiful, and that blooming magnolia tree was amazing. To be honest this monastery could not be compared with those grand monasteries in Italy or Iberia peninsular. I think I need to visit other Cistercian monasteries in order to under its outstanding and why it was listed by UNESCO. But with current knowledge Maulbronn exceeded my expectation and is a really nice World Heritage Site. The Cistercian Monastery Maulbronn was founded in 1147, and is considered the most complete and best-preserved medieval monastic complex north of the Alps. Surrounded by fortified walls, the main buildings were constructed between the 12th and 16th centuries. Follow the World Heritage Traveller in: Maulbronn. The complex is not particularly large in terms of area but it is big enough that some of the buildings within the complex are now part of the town and are used as shops, restaurants or offices (and even a police station and the town hall). It is worth having a look inside some of them – or having a meal or a drink. The main monastery complex is the highlight, though. You can go into the public part of the church for free and it is still used for regular services and special events. However, to access the monks’ side of the church you’ll need to buy a ticket for the monastery. This will also give you access to the main buildings at the core of the complex, including the small museum. Guided tours are also available and taking one of them would be a good idea if you’re interesting in finding out more about some of the detail of the rooms and the complex. The Maulbronn WHS is a perfect example of a medieval monastery, the special feature is that not only the monastic buildings have been preserved but also the entire ensemble of administrative and farm buildings. And the complex is still surrounded by the medieval walls and towers. Furthermore, the surrounding countryside remained essentially unchanged with vineyards, orchards and artificial ponds. Maulbronn illustrates the way of life in a medieval monastery. Today, most buildings have a modern use as a visitor centre, the town hall, a police station or a restaurant. But Maulbronn is a quiet little town and the monastery is not crowded with tourists, it seems like time has stood still and you can easily think back in the Middle Ages. I was twice in Maulbronn, the first time in the 1990s and then in June 2014, just one month after I visited the Poblet monastery. It was interesting to compare how the aesthetic principles of the Cistercians were realized at both sites. There are great similarities in style and layout of the rooms, it really appears like a standardized architectural concept: the restriction to the essential elements, the absence of ostentatious decoration, the use of high vaulted ceilings. And the result is impressive: a harmonious and functional architecture. 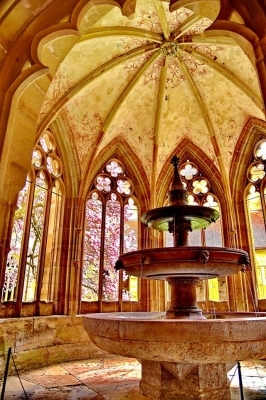 In Maulbronn, I liked most the refectory and the atmospheric cloister (photo) with the fountain house. The church is the oldest part of the monastery, not really outstanding, most remarkable are the entrance hall, the so-called 'paradise', and the portal with the original door leaves from the 12th century. Maulbronn is definitely worth a visit, if you go by car, it is only a twenty minute drive from the motorway. 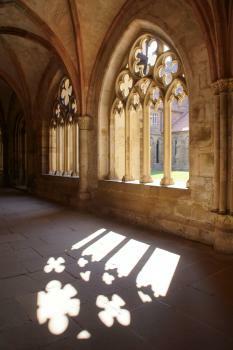 I visited Maulbronn Monastery for few hours in 2010. It is isolated in the "Toscano of Germany". Visiting this monastery looks like walking back in the Middle Age because of 100% authentic feeling. I got strong impression of Monastery town-planning. 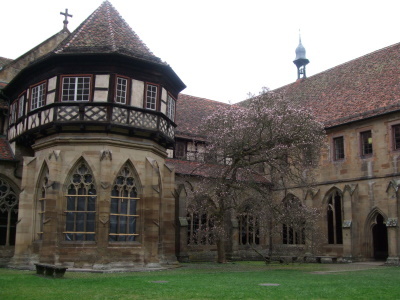 It is not tourist place that makes worth to visit Maulbronn Monastery. Known as the best-preserved medieval monastery north of the Alps, Maulbronn makes a nice excursion from Stuttgart or Karlsruhe (it is reachable from both cities by train and then by bus from e.g. Mühlacker). To me, the unique aspect of Maulbronn was not so much the church (very nice, but not so outstanding), but rather the fact that the whole complex is so well preserved and still looks today like a small medieval village grouped around its church. There are many half-timbered buildings, a village square with a small fountain, and a defensive wall. A visit to Maulbronn won't take long as it is quite small, but is certainly worth it. I visited Maulbronn Monastery in April 2013. It is practically intact with defense walls, a moat, gate, etc. The architecture is sublime and visiting on a weekday meant that I had the whole Kloster for myself. A really interesting and deserving WHS. If you visit this site, do try the local Maultasche with cheese ... delicious. The Maulbronn monastery is well worth a visit. It's a bit off the route so I consider to go by car. Most of the buildings are still in use as a museum, a very nice restaurant, a shop or even the town hall. The guided tour provides a lot of interesting information and allows you to see far more than e.g. in Pannonhalma. Don't expect to see a lot of pomp inside. The monks there are puritans and reject wealth, so rooms and even the church are rather spartanic. But the range of nice buildings and the complete wall made Maulbronn the best of the WHS monasteries I've seen so far. Maulbronn is still actively in use, all these hundreds of years after construction, as a school, so parts of the complex are off-limits to visitors. However, enough of it is open so that you can get a good feeling for what life was like in the 12 and 13th century monastery. I like the church especially, but it was very interesting to see the warming room (the only room in the monastery that had heat in the old days) and the dining halls. We walked around outside the north wall of the monastery and around a small lake which I believe was created by damming a stream during the monastery's period of active use. Good half day trip. Maulbronn was (at least that day) very empty, which provided excellent opportunity to just wander around in silence. It had a very authentic feel to it, which I believe had much to do with the purposeful withholding of drama or eyecatchers for tourists. There was a piano in one empty hall, and I sneaked in and played a few accords.. very nice! Gothic: The construction of the church was "of fundamental importance for the dissemination of Gothic architecture over much of northern and central Europe."